Protecting yourself against the potential threat of long-term care seems to be the topic clients dislike discussing the most. With health care costs on the rise and long-term-care insurance premiums climbing by double digits several insurers have exited the business in the past three years. 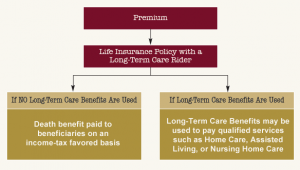 Many families are turning to an alternative: using life insurance with long-term-care benefits. One reason life insurance policies with long-term-care riders have taken off is that they overcome one of the biggest hurdles for buyers of long-term-care policies—writing a sizable check for a product you hope you will never use. By pairing long-term-care benefits with life insurance, you can lock in a payout for your spouse, children or other heirs, even if you don’t use the long-term-care benefit. 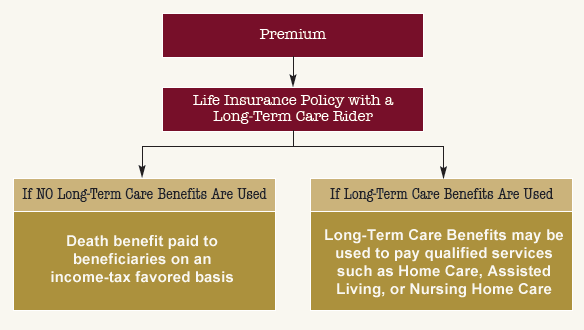 As with traditional long-term-care insurance, hybrid policies kick in when the policyholder needs help with two activities of daily living, eating, bathing, dressing, toileting, transferring (walking) and continence. The living benefits in these hybrid products are typically limited to the amount of the death benefit. Several options include receiving between 2-4% per month of the death benefit. The insurance carrier either pays you a set amount each month or reimburses the long-term-care expenses. The premiums are locked in, unlike a traditional long-term-care policy but, you also have to factor in a lack of inflation protection. One Asset For Long-Term Care: Families don’t always make plans for long-term care and all of a sudden they’re in a situation where they’re liquidating IRAs and paying huge taxes. The markets may not be on their side at the time. Even for clients who already have enough savings to cover long-term care you can use the life insurance to create a tax-free bucket. This way the family is not out there trying to figure out which asset to liquidate first to pay for the costs. Avoiding Premium Increases: We have heard stories of a client’s long-term-care insurance bill climbing more than 30% within the last year. With the hybrid products, the rates are guaranteed to stay the same. You don’t have to worry about the insurance company coming back and raising the premiums. Estate planning: If the long-term-care rider is what is called an “indemnity” benefit, not an expense reimbursement, you generally are allowed to put the insurance policy in an irrevocable trust and still use the accelerated death benefit for long-term care. When you pass away your heirs get whatever benefit is left tax-free, and it isn’t counted as part of your estate. You have to have the indemnity rider to do this. With an indemnity plan, the benefit is paid to the owner of the policy, which is the trust. If the benefit is paid directly to the insured person, the trust could be disqualified.